I’ve been having great fun with my new ball winder. My handspun looks totally professional all balled up, well at least I think it does. I was sorting out my scrap (shoe)box this week (thanks to a certain Gorgeous Girl who decided to help Mummy by emptying it on the floor) and discovered a UFO that I had become discouraged about a little while ago. 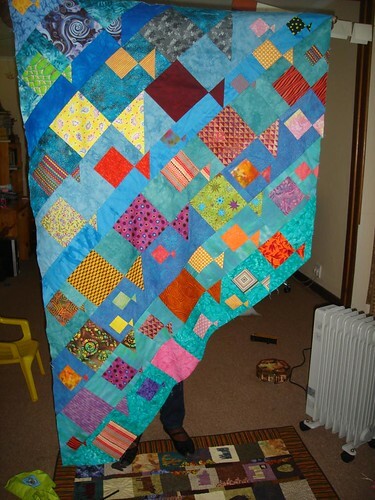 I decided to finish it anyway and give it to Gorgeous Girl as a doll quilt. She is currently very into looking after her ‘babies’. 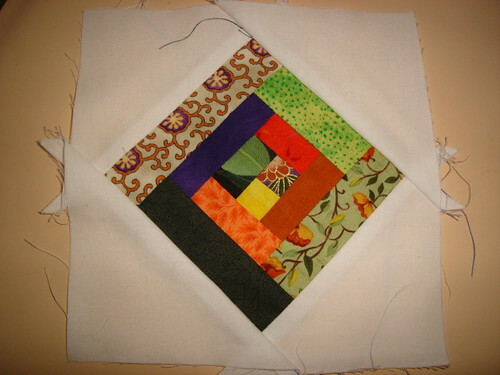 This was disappearing nine-patch made from scraps left over from my first quilt. Just got the binding to cut, sew and put on. This is the first machine quilting I’ve attempted since my disasterous class last year. I’m kind of pleased with how it turned out, though it could be better. 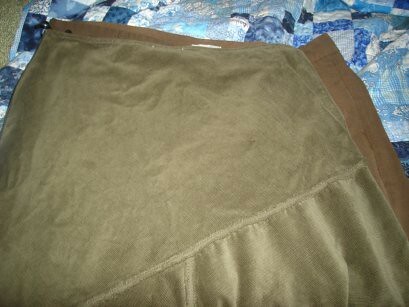 The backing and the batting came from stash, so that was nice to use it up. I’ve added another row to the fish quilt. 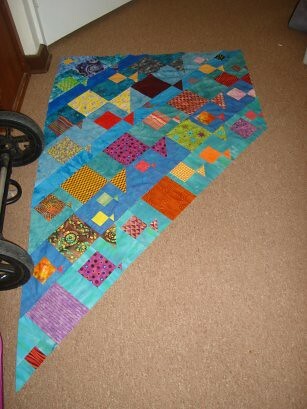 It’s starting to move across the bottom of the quilt now only 5 more rows to go and they get progressively shorter. I’ve got the sewing machine permanently set up and am sneaking in a few minutes here and there as I get a spare moment and that is really helping it to come along. Then borders and hand quilting. 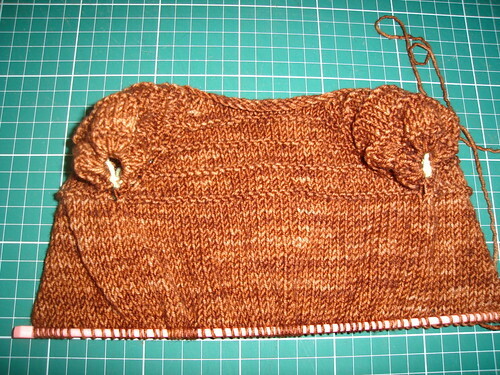 I’ve nearly finished a jumper (sweater) for Gorgeous Girl – big reveal when it’s done. 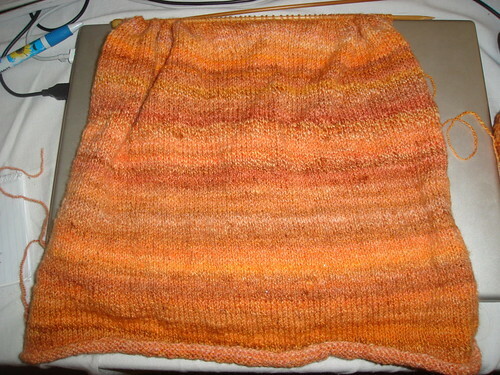 The cardigan for me is also coming along nicely. I’m a little concerned about the fit, but it hasn’t been blocked yet, and I am also shrinking, so it should be fine. I really must get out and take a picture of the vegetable garden, now that the seeds are big enough to be seen. 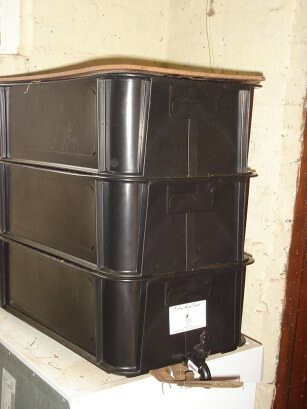 Pumpkins, potatoes, tomatoes, corn, carrots, beetroot, lettuce and spinach are all up. It’s going to be great. I went to my craft group, the Free Radicals, yesterday. This month it was my turn to receive quilt blocks. There are still a few to come in, but these are the blocks I received. Pretty. I gave each person a fish square to use either as inspiration or in the block. 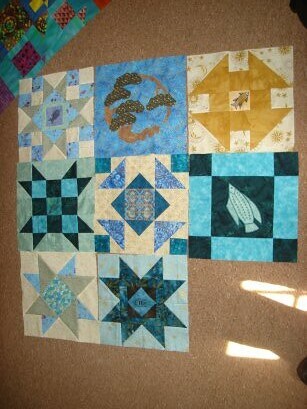 Once I receive the rest of the blocks I’ll know how many I need to make to turn it inot a useful sized quilt. 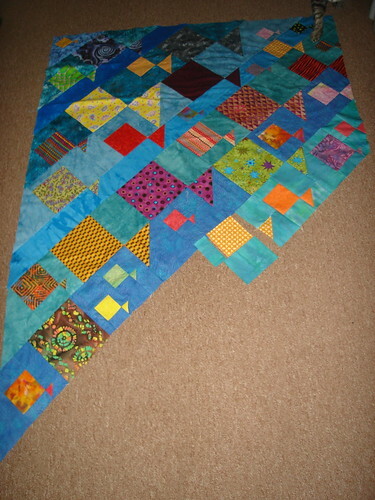 I managed to add another row to the fish quilt today. It’s coming together slowly but surely. I had to stop cutting for row 11 after I cut two strips the wrong size, and I’m on limited fabric since I’m using stuff I bought in the USA and can’t get more if I run out. Serve me right for continuing to cut fabric once Gorgeous Girl was awake… I’ve cleared up the craft room enough that the sewing machine is permanently out. That makes a big difference to sneaking 5 or 10 minutes of piecing here and there. It seems like spring has finally arrived after weeks of rain. 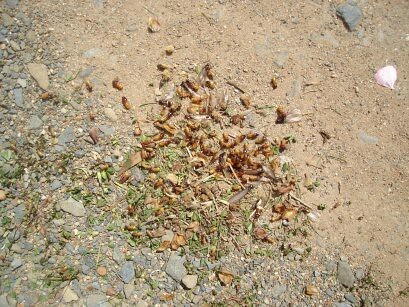 Today these little critters were in the backyard. Our little garden is starting to grow as well now that the weather is a bit warmer. The corn is up, so is the swiss chard and the lettuce, but the tomatoes have been disappointing. We’re going to give it a week or so and then replant the tomato seeds, it may have just been too cold and wet when we planted the first time. On Friday last week my very talented friend from Nurturing Fibres was in the area and called in to drop off a ball winder that she was kindly selling to me. She also brought along some rovings that she and some other local artisans have dyed, so that I could have a look, seeing as I’ve never seen anything (except the alpaca that she sold me last year) that other people have put together. Oh, so pretty! Once my finances recover from my spinning wheel purchase I’m going to be haunting her Etsy store 🙂 Go and check it out. I’m so excited that there seems to be more spinning stuff available locally than when I started last year. Not that I (ahem) need more stash. Must knit faster. I’m so thankful that she called in, as she worked some magic on my spinning wheel and it spins like butter again. I don’t have a manual and so had forgotten some of the tips that I was given in my 30 minute lesson when I bought it. Tonight is Tuesday for spinning and I’m looking forward to spinning like a mad thing once my shift finishes at 9 tonight. Not much other news, Gorgeous Man has been sick with the flu, and Gorgeous Girl has a runny nose. So that has kept me busier than usual. Can you believe that she turns 2 in 12 days time! Where has the time gone? Big news first: I’ve ordered a Schact Ladybug spinning wheel. Gorgeous Man will be bringing it home from the USA at the end of October. The universe wanted me to have this wheel – the dealer is walking distance from his hotel. He assures me he is able to get it home. Is it wrong that I am so excited about getting this wheel that I want to print off a picture and show it off to unsuspecting strangers? 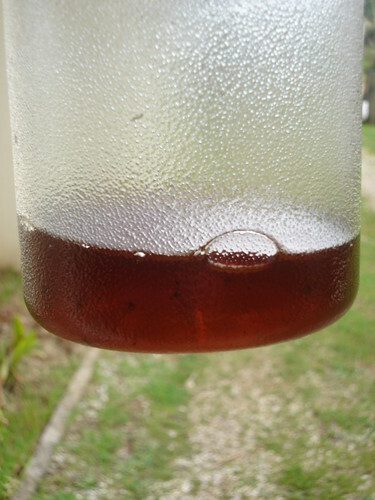 Other big news, my worm farm produced it’s first juice, which I diluted and poured on my parsley, roses and pansies with great relish. We had a fine day on Friday and so Gorgeous Man and I put some seeds in the garden, he also put in a few more on Sunday. The weather has deteriorated back to cold, driving rain and howling wind, but at least the rain is good for my little seeds. I decided that it had been a while since I’d had a charity project on the needles, so I dug into the charity stash (yarn that was given to me for the express purpose of knitting it up for charity) and cast on for this little cardigan. The colour is much richer in real life. 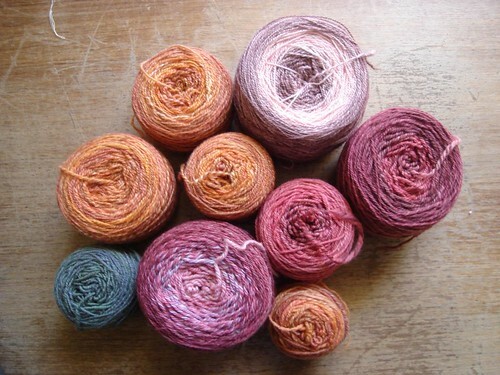 I think the yarn is Koigu – it’s fabulous to knit with. Details of the pattern on my project page in Ravelry. 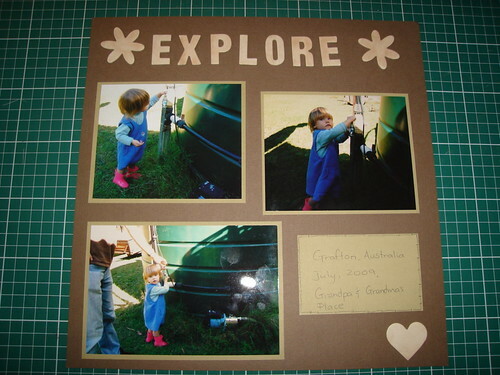 I managed to get one scrapbooking page done recently. Still working through my pile of Australian photos. These pages are mostly for Kerin’s benefit, so she can see the scrapping progress. One of the interesting things about living in a foreign country is that holidays are sometimes different. Father’s Day in South Africa occurs in June. However, since we were in Australia, Gorgeous Man missed out. So we decided to celebrate Australian Father’s Day instead. Gorgeous Girl made a card. 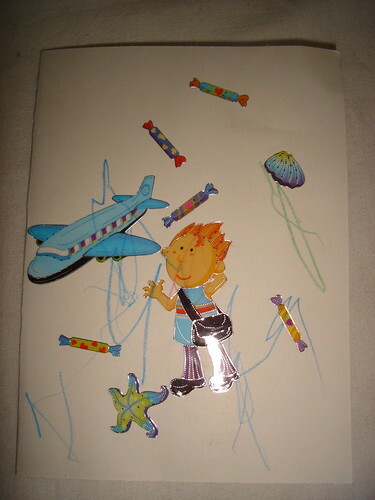 I provided the pre-folded card, crayons and stickers and she did the rest . Just to show that I do still sew. I managed to sneak some time on my fish quilt while Gorgeous Girl was sleeping yesterday. 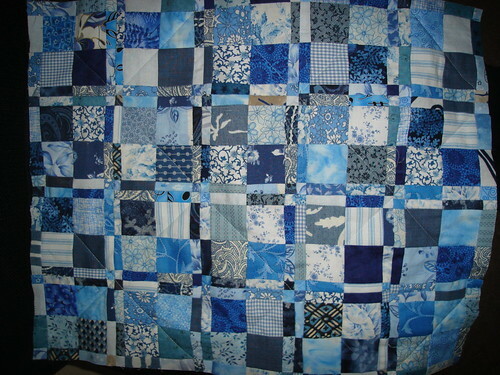 If I was to do this again, I would make all the blue a single fabric, but it’s coming along nicely. I also managed to find some time to cut some more setting triangles for my leaders and enders project. The logcabin blocks are 4 inches finished. The centre square is 1/2 an inch (one inch cut). I’m not sure what I’m going to do with them once I’ve set them all square in a square, will lay them out and consider my options when I get to that point I guess. That is very unusual for me. I usually quilt to a plan. Just a quick post to share some current works in progress. Merino I dyed myself. The yellow varies between that colour and a brilliant orange. 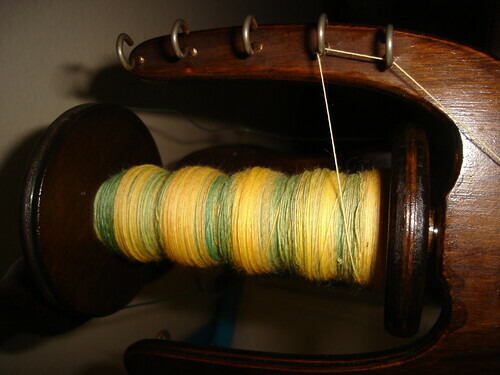 The plan is to Navajo-ply this (three plied on itself in a chain) for socks. I’m hoping it’s going to look OK. Even if it doesn’t it’ll be a good cardigan to keep me warm around the house. We are back in the depths of winter weather at present. I don’t have to work this weekend. So I’m hoping to spend some quality time with the quilt and the sewing machine. Currently the quilt is going very slowly because I can only work on it when Gorgeous Girl is sleeping, or out of the house as she likes to ‘help’. We were planning on doing some planting for the garden, but showers are predicted so unless the weather changes we’ll have to put those plans on hold.